“an internationally recognized status conferred by the Nuclear Non-Proliferation Treaty (NPT)”. Three other “Non NPT countries” (i.e. non-signatory states of the NPT) including India, Pakistan and North Korea, have recognized possessing nuclear weapons. But what about the five European “undeclared nuclear states” including Belgium, Germany, Turkey, the Netherlands and Italy. Do they constitute a threat? The US has supplied some 480 B61 thermonuclear bombs to five so-called “non-nuclear states”, including Belgium, Germany, Italy, the Netherlands and Turkey. 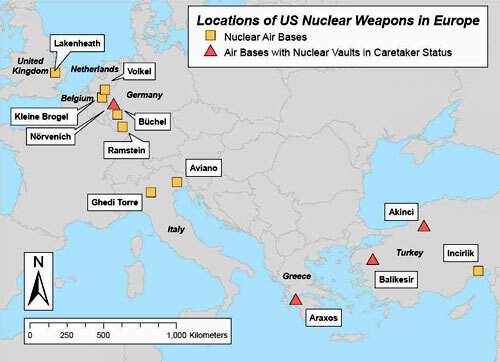 Casually disregarded by the Vienna based UN Nuclear Watchdog (IAEA), the US has actively contributed to the proliferation of nuclear weapons in Western Europe. By the recognized definition, these five countries are “undeclared nuclear weapons states”. Does this mean that Iran or Russia, which are potential targets of a nuclear attack originating from one or other of these five so-called non-nuclear states should contemplate defensive preemptive nuclear attacks against Germany, Italy, Belgium, the Netherlands and Turkey? The answer is no, by any stretch of the imagination. The stockpiled weapons are B61 thermonuclear bombs. All the weapons are gravity bombs of the B61-3, -4, and -10 types 2. Among the five “undeclared nuclear states”, “Germany remains the most heavily nuclearized country with three nuclear bases (two of which are fully operational) and may store as many as 150 [B61 bunker buster ] bombs” (Ibid). In accordance with “NATO strike plans” (mentioned above) these tactical nuclear weapons are also targeted at the Middle East. While Germany is not categorized officially as a nuclear power, it produces nuclear warheads for the French Navy. It stockpiles nuclear warheads (made in America) and it has the capabilities of delivering nuclear weapons. Moreover, The European Aeronautic Defense and Space Company – EADS, a Franco-German-Spanish joint venture, controlled by Deutsche Aerospace and the powerful Daimler Group is Europe’s second largest military producer, supplying .France’s M51 nuclear missile. Germany imports and deploys nuclear weapons from the US. It also produces nuclear warheads which are exported to France. Yet it is classified as a non-nuclear state. This entry was posted on Monday, August 13th, 2012 at 12:26 pm	and tagged with Belgium, Iran, List of states with nuclear weapons, Middle East, NATO, Nuclear weapon, Turkey, United States and posted in Banks, Debts, environmental threats, EU, freedom, Government Games, Human Rights, nuclear threat, Occupy movement. You can follow any responses to this entry through the RSS 2.0 feed. « Surprise:UNGA RES. 31/72, TIAS 9614:: UN Law Banning Climate Warfare Technology!